A worker watches as a conveyor loads coal onto a trailer truck at a coal mine near Ordos in northern China's Inner Mongolia Autonomous Region, November 2015. China’s new coal-fired power plants are cleaner than ours—and stronger on climate change. China’s energy markets send mixed signals about the nation’s policy intentions and emissions trajectory. Renewable energy analysts tend to focus on China’s massive renewable expansion and view the nation as a global clean energy leader; coal proponents and climate skeptics are more likely to focus on the number of coal plants in China—both in operation and under construction—and claim its climate rhetoric is more flash than substance. In December 2016, the Center for American Progress brought a group of energy experts to China to find out what is really happening. We visited multiple coal facilities—including a coal-to-liquids plant—and went nearly 200 meters down one of China’s largest coal mines to interview engineers, plant managers, and local government officials working at the front lines of coal in China. We found that the nation’s coal sector is undergoing a massive transformation that extends from the mines to the power plants, from Ordos to Shanghai. China is indeed going green. The nation is on track to overdeliver on the emissions reduction commitments it put forward under the Paris climate agreement, and making coal cleaner is an integral part of the process. From a climate perspective, the ideal scenario would be for China to shut down all of its coal-fired power plants and switch over to clean energy full stop. In reality, China’s energy economy is a massive ship that cannot turn on a dime. The shift toward renewables is happening: China’s Paris commitment includes a promise to install 800 gigawatts to 1,000 gigawatts of new renewable capacity by 2030, an amount equivalent to the capacity of the entire U.S. electricity system.1 While China and the United States have roughly the same land mass, however, China has 1.3 billion people to the United States’ 325 million.2 It needs an electricity system that is much larger, so adding the renewable equivalent of one entire U.S. electricity system is not enough to replace coal in the near to medium term. To bridge the gap, China is rolling out new technologies to drastically reduce local air pollution and climate emissions from the nation’s remaining coal plants. China’s new coal-fired power plants are cleaner than anything operating in the United States. China’s emissions standards for conventional air pollutants from coal-fired power plants are stricter than the comparable U.S. standards. Demand for coal-fired power is falling so quickly in China that the nation cannot support its existing fleet. Many of the coal-fired power plants that skeptics point to as evidence against a Chinese energy transformation are actually white elephants that Chinese leaders are already targeting in a wave of forced plant closures. Energy solutions that work well for China will not necessarily work well for the United States. In addition to the massive population disparity, the United States has access to cheap and plentiful shale gas, and China does not. 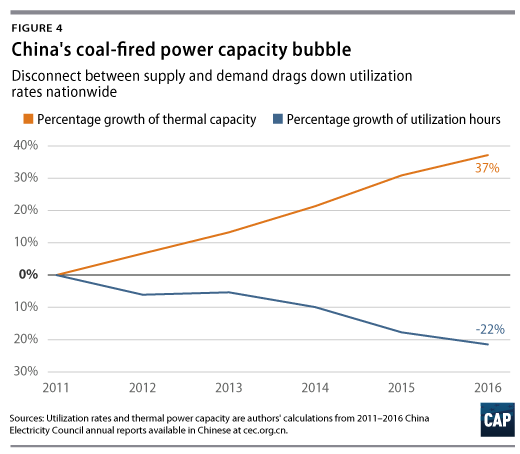 If China is going to reduce emissions substantially, more efficient coal generation has to be part of its equation, at least for the near to medium term. In the United States, investing in next-generation clean coal plants is not a good solution because natural gas is cheap, plentiful, and lower-emitting than all but the most expensive coal-fired power. Regardless of what works best in the U.S. market, understanding how Beijing is transforming its coal sectors is critical for understanding what to expect from the Chinese energy market going forward and how we should view China’s position in the global effort to combat climate change. Beijing is stuck between a rock and a hard place. On the one hand, China cannot eradicate coal-fired power from its energy mix overnight. China has not yet figured out how to develop its own natural gas supplies—which are more difficult to access and therefore more expensive than those in the United States—and renewable energy expansion takes time. On the other hand, Chinese citizens are demanding cleaner air, and they want immediate improvements. Air quality is now a political priority for the Chinese Communist Party on par with economic growth and corruption. This means that China cannot continue to run the same high-pollution coal plants that were considered acceptable decades ago. Beijing’s solution is to move full speed ahead with renewables while simultaneously investing in what may become the most efficient, least polluting coal fleet the world has ever seen. Not all coal-fired power is created equal. Emissions and efficiency—the latter being the amount of coal consumed per unit of power produced, which also affects emissions—vary dramatically based on the type of coal and coal-burning technology used. What many U.S. analyses of China’s coal sector overlook is the fact that Beijing has been steadily shutting down the nation’s older, low-efficiency, and high-emissions plants to replace them with new, lower-emitting coal plants that are more efficient that anything operating in the United States. 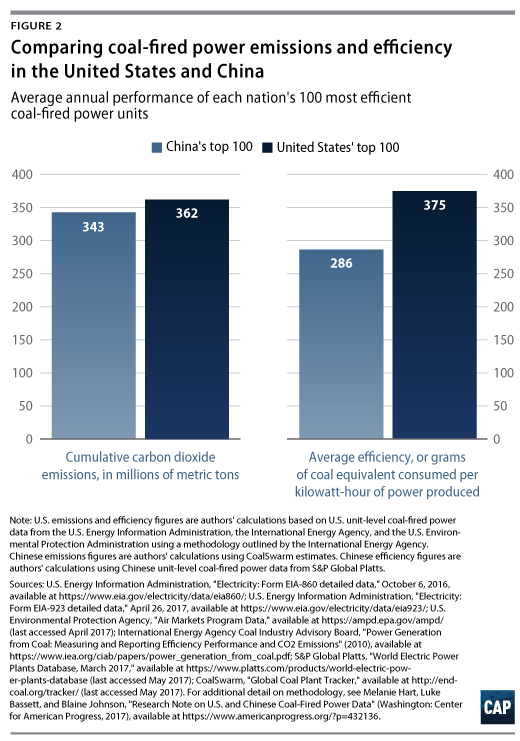 To better understand where China’s coal fleet is going, CAP compared the top 100 most efficient coal-fired power units in the United States with the top 100 in China. (see Tables A1 and A2) The difference is astounding. The U.S. coal fleet is much older than China’s: The average age of operating U.S. coal plants is 39 years, with 88 percent built between 1950 and 1990.7 Among the top 100 most efficient plants in the United States, the initial operating years range from 1967 to 2012. In China, the oldest plant on the top 100 list was commissioned in 2006, and the youngest was commissioned in 2015. The United States only has one ultra-supercritical power plant.8 Everything else is subcritical or, at best, supercritical. In contrast, China is retiring its older plants and replacing them with ultra-supercritical facilities that produce more energy with less coal and generate less emissions as well. Out of China’s top 100 units, 90 are ultra-supercritical plants. 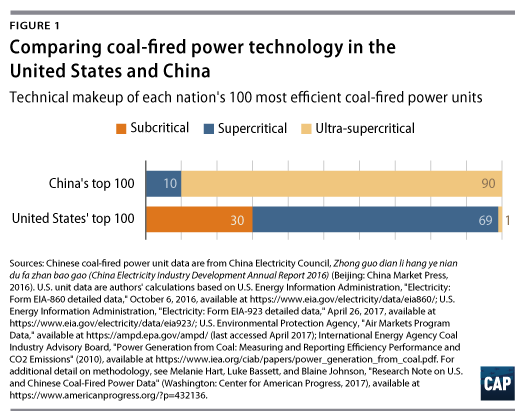 When the capacity of each of the top 100 units in each nation is taken into account, ultra-supercritical technology accounts for 92 percent of Chinese top 100 capacity and less than one percent—0.76 percent—of U.S. top 100 capacity. Because the technological makeup of the Chinese plants is different, their emissions levels are different as well. In the United States, the total nameplate capacity of our top 100 most efficient coal-fired power units is 80.1 gigawatts, and their cumulative annual carbon emissions amount to 361,924,475 metric tons.9 Meanwhile, the total nameplate capacity of China’s top 100 units is 82.6 gigawatts, and their cumulative annual carbon emissions are an estimated 342,586,908 metric tons.10 Since China’s fleet uses more advanced technology, it also consumes less coal: an average of 286.42 grams of coal equivalent, or gce, consumed per kilowatt-hour of power produced in China versus 374.96 gce consumed per kilowatt-hour produced at lower heating value in the United States. To be sure, China still has plenty of older coal-fired power units that are not using the most advanced technology. According to the latest third-party research from S&P Global Platts, which provides research on global energy infrastructure, when the data set is expanded to include all operating coal-fired power capacity in China—which totals 920 gigawatts—approximately 19 percent uses ultra-supercritical technology, 25 percent uses supercritical technology, and 56 percent uses subcritical technology.11 However, the new builds are increasingly ultra-supercritical plants, and Beijing is steadily ratcheting up the emissions requirements and efficiency standards for those older plants as well. The simple fact is that the United States has a wide array of cheap and abundant energy options that now compete with coal-fired electricity generation—particularly shale gas and renewables. Given the additional context of falling U.S. electricity demand and improving efficiency, even U.S. electric utility executives have indicated that their business models are rebalancing toward these options—and away from coal.12 Although higher-tech plants, such as ultra-supercritical plants, have lower operation and maintenance costs than their less efficient counterparts, overnight capital costs are, on average, around 17 percent higher.13 In a market where even the least expensive coal-fired plants are struggling to compete with shale-gas-fired plants, those investments do not make good financial sense. One of the levers that Beijing is pulling to move China’s coal-fired power fleet toward the cleanest, most efficient technologies on the market is steadily tightening pollution emissions standards. Prior to this shift, Chinese citizens knew the air was bad but did not have the scientific information they needed to tie air quality to specific health effects. Today, Chinese citizens assess local PM 2.5 levels throughout the day and know what those particulates are doing to their children.29 For the Chinese Communist Party, there is no going back—this is now a political survival issue, and recent regulatory trends reflect that. 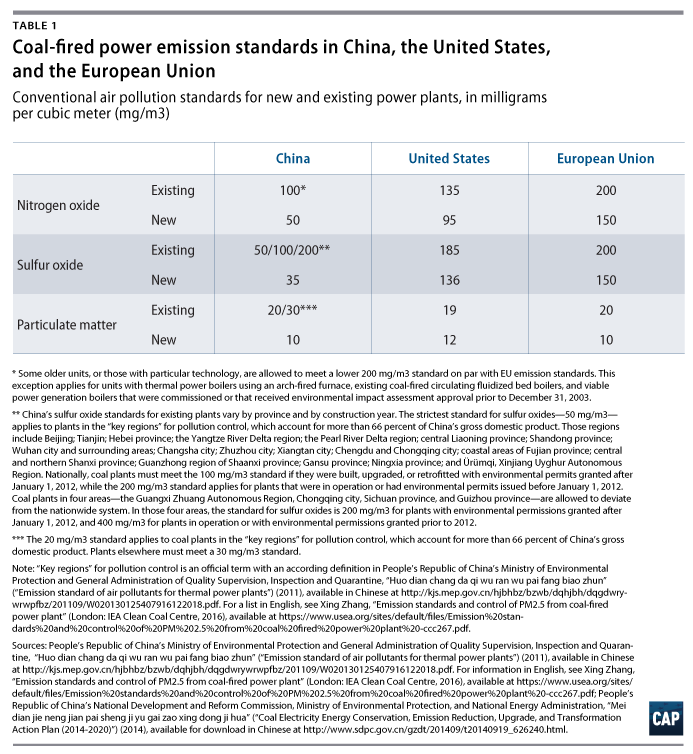 Starting in 2014,30 China rolled out new air pollution emissions standards for new and existing coal-fired power plants that are stronger than the comparable standards from the European Union and the United States. When visiting coal facilities in China, CAP found that some coal-fired power facilities display real-time emissions levels for these key local air pollutants on large billboards outside the main gate, particularly the cleaner plants that want to advertise their technical superiority. Currently, Beijing is primarily concerned with tightening emissions standards for conventional air pollution, since that is the primary concern of the Chinese public. The next round of regulatory tightening will target carbon dioxide. If current U.S. regulatory trends continue, by 2020, every coal plant operating in the United States would be illegal to operate in China. What American observers need to know is that many of those new plants are white elephants that China cannot fully utilize. They represent a blip rather than a trend, and Beijing is already moving to shut down many of these new plants. In 2014, energy policy collided with a parallel Chinese bureaucratic initiative to reduce red tape. 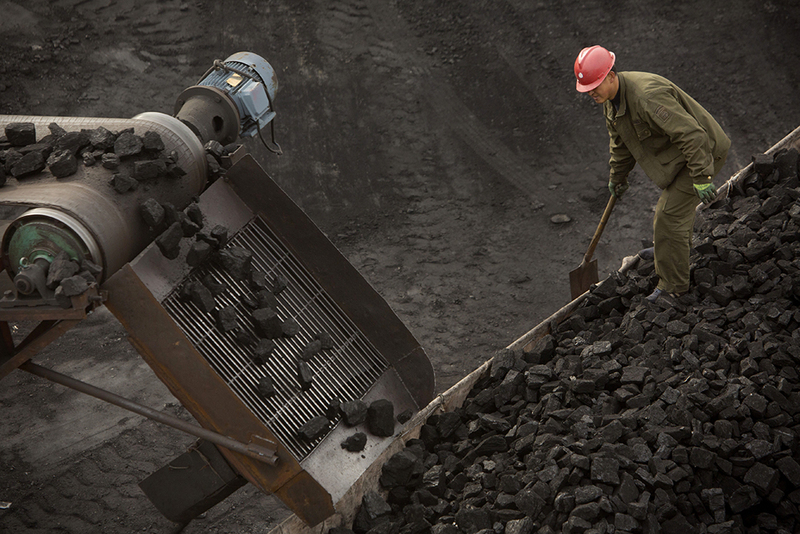 Prior to 2014, constructing a new coal plant required central government approval; in October 2014, Beijing devolved that approval authority down to the provinces.34 Since local government officials understand their regional demand circumstances better than central planners, Beijing assumed that local officials could make faster and better project approval decisions, thus improving administrative efficiency. The problem was that Beijing underestimated the other interests affecting those decisions at the local level. Beijing ordered local officials to assess new project applications based on local demand conditions and central government energy policy priorities, which included a shift away from coal-fired power.41 Instead, local officials all raced to be the last coal-fired province standing. The result was a glut of coal plants that the nation could not actually use.42 Grid operators responded by spreading purchase quotas thinner and thinner among the nation’s expanding fleet of coal-fired power plants. Currently, Beijing is forcing every plant in the nation to run at the same utilization rate, which is approximately 47.7 percent of total plant capacity.43 In 2016, plant utilization fell to levels that China had not seen since the 1970s, when the nation was just emerging from the cultural revolution. As soon as Chinese leaders saw what was happening they issued a series of orders aimed at reigning in this behavior. (see text box: China regulatory timeline) They started out ordering local officials to do a better job matching project approvals to local demand and to Beijing’s energy policy dictates; when that failed to stem the tide, Beijing started intervening to cancel projects, including many projects that were already under construction. Earlier this year, China’s National Energy Administration canceled 103 coal-fired power projects across 13 provinces that, if completed, would have added 120,000 megawatts of coal-fired power to the grid.44 Beijing is also steadily shutting down older, existing plants that cannot meet the nation’s increasingly tight emissions regulations. In Beijing, Chinese leaders have a clear policy vision. They want to grab the clean energy bull by the horns and leverage those technologies to create new jobs at home and new export opportunities abroad.45 When local officials went on a coal-fired power construction approval spree, Beijing recognized that local incentive structures did not match national priorities and cracked the whip. Now thermal capacity growth is dropping, and that drop is likely to accelerate going forward. The United States has a broader array of energy options than China does. However, China is innovating and investing heavily in what it has, and some of the transformations it is achieving already are truly impressive. China’s leaders have made a strategic choice about the direction of the country: They are aiming to shift from an economy based on heavy, polluting industries to one driven by technology and innovation. The political will for this upgrade has roots in both international geostrategic ambitions and domestic popular grievances about lagging standards of living—and it is beginning to bear fruit. In the process, however, vested interests and technical stumbling blocks have wasted resources and acted as a ballast against Chinese progress. China has the potential to do much more, and the international community should push it to achieve that potential. For the United States, the signal should be clear: We cannot compete with China on coal-fired power, nor should we aspire to do so. 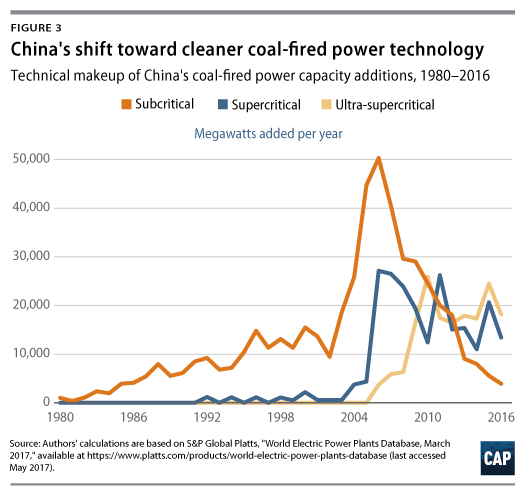 Mimicking China’s development path with regards to intensive coal development would ignore economic reality and the United States’ competitive advantages in the electricity sector and beyond. “Government Approvals for Investment Projects Catalogue 2014 Version” (State Council):47 Gives provincial-level officials the authority to issue construction permits for new coal-fired power plants. Previously, only central government officials could issue those permits. This 2014 notice delegated permitting authority down to the provinces but also instructed provincial officials to strictly follow central government coal control plans. “Notice on the Appropriate Use of Project Approvals for Electric Power Plants Under Decentralized Authority” (National Development and Reform Commission and National Energy Administration):48 Orders provincial authorities to stay within the boundaries of China’s national coal control objectives. States that provincial authorities must base new coal plant approval decisions on local demand conditions and complete the closing down and elimination of outdated coal-fired power plants before approving new ones. This notice also warns local officials that the National Energy Administration will monitor regional coal-fired power capacity and force officials in overcapacity regions to make cuts. “Notice on Promoting the Orderly Development of Coal Power” (National Development and Reform Commission and National Energy Administration):49 Calls for a phaseout of older coal-fired power units that fail to meet efficiency, environment, or safety standards. Orders local officials to shut down and eliminate smaller coal-fired power units—300 megawatts and below—and those that have been in operation for 20 years or more. Orders 13 provinces and regions with excess coal-fired power capacity—Anhui, Fujian, Gansu, Guangdong, Heilongjiang, Henan, Hubei, Inner Mongolia, Jiangsu, Ningxia, Shandong, Shanxi, and Yunnan—to halt all new project approvals until 2017. Orders 15 provinces—Gansu, Guangdong, Guangxi, Guizhou, Heilongjiang, Henan, Hubei, Inner Mongolia, Jiangsu, Liaoning, Ningxia, Shaanxi, Shandong, Shanxi, and Yunnan—to delay the construction of approved projects until after 2017. “Notice on Establishing a Coal Power Planning and Construction Risk Early Warning Mechanism” (National Energy Administration):50 Establishes a “traffic light” system to curtail the construction of new coal-fired power plants. Gives provinces a red light, orange light, or green light designation based on three factors: resource constraints; coal plant profitability; and existing coal-fired power capacity. Provinces with a red score in any of the three categories must immediately stop approving new projects; provinces with an orange score must proceed with caution. If a province suffers from severe air pollution, insufficient water resources, excess coal-fired power consumption, or excess production capacity, the province automatically receives a red light. This notice designated 26 provinces and municipalities as red light areas required to immediately halt all new coal plant construction projects. “Notice on Moving Forward to Phase Out Outdated Production Capacity in the Coal Power Industry” (National Development and Reform Commission and National Energy Administration):51 Defines standards and procedure for phasing out 20 gigawatts of outdated coal-fired power as required under the 13th five-year development plan for 2016 to 2020. Coal-fired power units targeted for retirement include smaller units without combined heat and power, units that fail to meet 2013 coal consumption efficiency standards, and units that fail to meet emissions standards. This notice orders utility companies to disconnect retired units from the electric grid and states that electricity generation companies that fail to comply with unit retirement orders will be punished. The notice also holds generation companies responsible for “properly handling the aftermath” with laid-off workers—for example, by assisting with worker retraining and transfers to other employment opportunities—to avoid triggering social unrest. “Notice Canceling Multiple Coal Power Projects Lacking Approved Construction Conditions” (National Energy Administration):52 Orders provincial authorities to cancel specific coal-fired power projects as part of implementing the March 2016 “Notice on Promoting the Orderly Development of Coal Power.” Targets 15 coal-fired power construction projects for cancelation—totaling 12.4 gigawatts—across 9 provinces. If the targeted projects have already commenced construction, then those activities must be halted regardless of the ramifications for investors. Warns provincial officials that the National Energy Administration will be on the lookout for “fake cancel, actually build” schemes and that any companies caught violating coal cancellation orders will be placed on a nationwide blacklist. The notice orders financial institutions, grid companies, licensing entities, and other relevant government agencies to refrain from issuing loans, business licenses, coal-fired power construction permits, and electric grid connection permits to companies violating this notice. “13th Five-Year Development Plan for the Electricity Sector (2016-2020):”53 Issues multiple five-year coal control targets including: reducing coal dependence from 59 percent of electricity production at year-end 2015 to no more than 55 percent by 2020; capping national coal-fired power capacity at 1,100 gigawatts; reducing sulfur oxide and nitrogen oxide emissions from coal-fired power plants more than 300 megawatts in size by at least 50 percent by 2020; and reducing carbon dioxide emissions to no more than 865 grams per kilowatt-hour. Also requires coal-fired power plants to achieve average coal consumption rates of no more than 300 grams of coal equivalent per kilowatt-hour for new plants and no more than 310 gce per kilowatt-hour for existing plants. Coal-fired power plants that cannot meet the new efficiency and emissions standards are to be shut down and disconnected from the grid. New coal-fired power construction projects that push regional and national capacity beyond the 1,100 gigawatt cap are to be canceled, including projects that have already commenced construction. Letter Regarding Scale of Coal Production Being Put into Operation Across Multiple Provinces in 13th Five-Year Plan Period (National Energy Administration):54 Orders 13 provinces—Gansu, Guangdong, Guangxi, Henan, Inner Mongolia, Liaoning, Ningxia, Qinghai, Shaanxi, Shandong, Shanxi, Sichuan, and Xinjiang—to halt construction activity and planning work for more than 102 gigawatts of new coal-fired power projects previously approved by provincial authorities. Provincial authorities approved those projects despite falling market demand and central government orders to reduce the nation’s dependence on coal and other fossil fuels.